Diamoness Cameo Sterling Silver Crystal Mother and Child Family Pendant Necklace Celebrate the family bond and love between a mother and child with this sentimental Diamoness Sterling Silver Crystal Mother and Child Pendant. 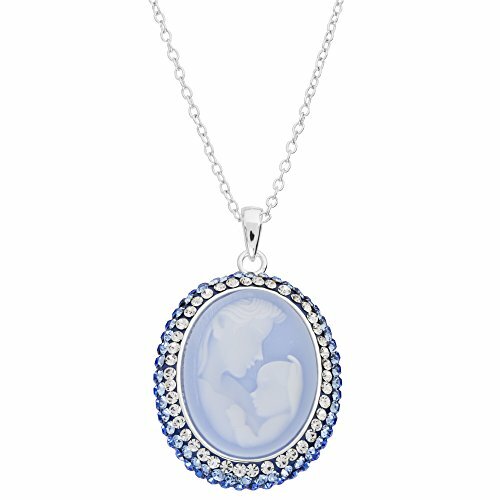 Crafted in sterling silver and set with crystals, the cameo pendant necklace hangs from an 18 inch chain with a spring ring clasp for a secure fit. Each mother and child pendant comes in a beautiful gift box making it a perfect gift for any woman including your mom, daughter, sister, granddaughter, niece or any loved one. Diamoness cameo sterling silver crystal mother and child family pendant necklace, 18"
Gift box included making it perfect for all gift giving occasions for any woman including moms, mothers, daughters and sisters including birthdays, Mother's Day, Christmas or Valentine's Day. If you have any questions about this product by Diamoness, contact us by completing and submitting the form below. If you are looking for a specif part number, please include it with your message. 1 1/2in Solid 0.925 Sterling Silver & 14k Gold Ribbon Cross Pendant 3.0mm Figaro Necklace, 24"
Men's 0.925 Sterling Silver Genuine Peridot 1.5in Irish Celtic Knot Cross High Polished Pendant 3.3mm Rope Necklace, 20"
1 5/16in 0.925 Sterling Silver St Saint Florian Badge Medal Pendant 3.0mm Curb Necklace, 24"
1 3/8in 0.925 Sterling Silver Thorn Crucifix Cross Pendant 3.0mm Curb Necklace, 24"
Men's 0.925 Sterling Silver Simulated Opal 1.5in Irish Celtic Knot Cross High Polished Pendant 3.3mm Rope Necklace, 24"